With the arrival of the Michelin Guide in Singapore, the quest to achieve stars, or hang on to them, now has a new momentum. Restaurateurs and chefs have been quick to revamp spaces, retool menus or introduce new concepts. Some have also hired new chefs. After a month-long renovation, Iggy's at The Hilton Singapore re-opened last month with new Spanish- Australian head chef Aitor Jeronimo Orive, 34, helming the kitchen. Over at One Fullerton, French fine-dining restaurant Saint Pierre has a new executive chef in Frenchman Mathieu Escoffier, 30. Neither restaurant received a Michelin star, although both were given special mention in the guide book under the "very comfortable" category. The presence of both chefs is timely, as the restaurant owners were looking for new head chefs to run the kitchens. Orive comes highly recommended by chef Andoni Luis Aduriz of two-Michelin-starred Mugaritz restaurant in Spain, says Iggy's owner Ignatius Chan, 52. He adds: "I am most impressed with Aitor for his gastronomic philosophy of keeping his creations simple. He avoids using more than three to four components in a dish. "This is particularly hard to achieve because it tests the skills of a chef and has little margin for error as every component in the dish must be perfect." Saint Pierre's chef-owner Emmanuel Stroobant, 48, says: "I'm getting old. So now it's time for someone else to take the helm. Everything (about Escoffier) was in line with what I was looking for." Along with the new chef's arrival, Stroobant also has a new, youthful team at Saint Pierre. Luxembourg-born head chef KimKevin De Dood is 24, and has worked at three-Michelin-starred restaurants The Waterside Inn in Britain and Hertog Jan in Belgium. His colleague, French-born pastry chef Jonathan Allaert, 29, has worked in France with acclaimed French chef Yannick Alleno at Dior des Lices restaurant. He has also cooked at the two-Michelin-starred Trianon Palace. This is the first time both chefs Escoffier and Orive are in Singapore, and their experience at various Michelin-starred establishments overseas may well give these restaurants a boost for next year's edition of the city's Michelin Guide. The Sunday Times speaks to both chefs. When asked about how his previous work experience can help Iggy's earn a coveted Michelin star, Spanish-Australian head chef Aitor Jeronimo Orive, 34, calls it a "tricky question". All he will say is that earning a Michelin star is a "team effort and not something I can achieve on my own". "You need to harness your team to get the most out of every one of them. As I've worked with several Michelin-starred chefs and still have very close friendships with them, I will apply all the knowledge and skills handed down to me," he adds. While he credits his paternal grandmother from the Basque country and his maternal grandmother from Andalusia for being the biggest influences in his cooking career, he picked up his "progressive cooking techniques and precision cooking" at various establishments. These include two-Michelin- starred Mugaritz in Spain, three-Michelin-starred The Fat Duck in Britain and one-Michelin-starred Nerua Guggenheim Bilbao in Spain. More recently, he was part of the opening team for Spanish chef Paco Roncero's outpost Barbarossa Paco Roncero in Shanghai. The 34-year-old chef joined Iggy's in June and has been a part of its month-long revamp. The restaurant re-opened last month on its 12th anniversary. On his new menu, the bachelor says: "I don't believe I should just replicate my past repertoire at Iggy's. I'd like to be inspired by traditional and heritage food, and make them my own." For example, his dish of carabineros risotto is inspired by the rich broth of local prawn noodles. The stock is made with the roasted shells of the prawns and the crustaceans are served carpaccio-style. Spanish Bomba rice is used for the risotto. Other dishes on the menu include seafood Bomba rice, suckling pig and pigeon, along with an array of snacks. The menu is priced from $235 to $275 depending on the choice of main course. There is also a shorter dinner menu at $150++ (with rice as the main course). Vegetarian menus are available upon request. The four-course lunch costs $105++. Do not be deceived by his surname - French chef Mathieu Escoffier, 30, is not related to the late, great French chef Auguste Escoffier. Still, the younger Escoffier has robust roots in cooking as his family has always been in the restaurant business. For the past 20 years, his parents have been running French bistro Ma Cuisine in his hometown of Beaune. His older brother and uncle also run their own bistros in Bordeaux and Burgundy respectively. But it is his late maternal grandfather, who used to run the one- Michelin-starred restaurant L'ermitage Corton, whom he regards as his mentor. He says: "He was such an inspiration for me and by the age of 14, I knew that I wanted to be a chef. It's 100 per cent due to him that I carry on cooking every day." During his final year of catering school, Escoffier went to work at the eponymous three-Michelin- starred restaurant of Regis Marcon for six months. He says: "I discovered gastronomy at a high level. But the chef remained humble and he knew how to push people in a good way." Since then, he has worked at various French establishments such as Maison Lameloise, Plaza Athenee and Daniel Boulud - all with three Michelin stars. Before coming to Singapore, he was executive sous chef at Joel Robuchon a la Grand Maison in Bordeaux last year. Instead of continuing to work in Michelin-starred restaurants, he chose to look for a "new challenge". Through a mutual friend, he was put in touch with Saint Pierre's chef-owner Emmanuel Stroobant. Other brands here under the group include two-Michelin- starred Japanese restaurant Shoukouwa, as well as more casual restaurants such as Sque Rotisserie & Alehouse, Brussels Sprouts and Picotin Express. Stroobant remains very much involved with menu planning at Saint Pierre. With Escoffier, he launched a new seasonal menu last Thursday. Lunch is priced from $58++ for a three-course meal, while dinner is priced from $148++ (four-course) to $228++ (eight-course). Vegetarian and children's menus are also available. New dishes include a starter of kinmedai sashimi with kombu-ponzu gel, yuzu zest, wasabi, lemon oil and oscietra caviar; and bouillabaisse of rock fish consomme with saffron, sea urchin rouille (sauce), barbecued king prawn and red mullet. 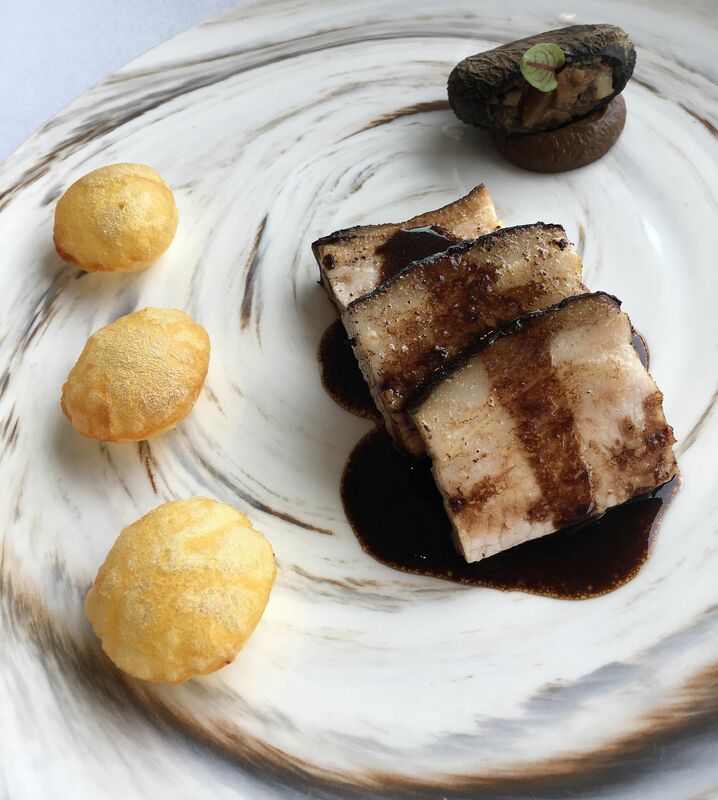 Escoffier has settled so nicely in Singapore that he is even showcasing buah keluak with 12-hour sous vide Iberico pork (pictured). He says: "The texture of buah keluak is really new to me, almost like black garlic. At first, the bitter chocolate taste sets in, followed by the earthy notes. "I made a farce (stuffing) to fill up the buah keluak shell and added some pulled pork, diced foie gras, oven-baked pear brunoise and parsley. The combination of the different hints of flavours from each ingredient balances the taste of the buah keluak very well." On how the Michelin Guide is influencing the Singapore food scene, he says: "I know how it is good for the city, the restaurant scene and the customers. The standard of service and food go up because everyone knows that someone will judge them."